The Berber languages, also known as Berber or the Amazigh languages (Berber name: Tamaziɣt, Tamazight; Neo-Tifinagh: ⵜⴰⵎⴰⵣⵉⵖⵜ, Tuareg Tifinagh: ⵜⵎⵣⵗⵜ, pronounced [tæmæˈzɪɣt], [θæmæˈzɪɣθ]), are a branch of the Afroasiatic language family. They comprise a group of closely related languages spoken by the Berbers, who are indigenous to North Africa. The languages were traditionally written with the ancient Libyco-Berber script, which now exists in the form of Tifinagh. 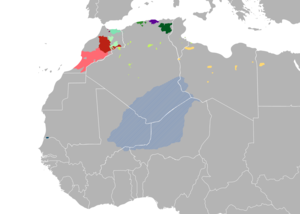 Berber-speaking populations are dominant in the coloured areas of modern-day North Africa. The other areas of North Africa contain minority Berber-speaking populations. Berber is spoken by large populations of Morocco, Algeria and Libya, by smaller populations of Tunisia, northern Mali, western and northern Niger, northern Burkina Faso and Mauritania and in the Siwa Oasis of Egypt. Large Berber-speaking migrant communities, today numbering about 4 million, have been living in Western Europe, spanning over three generations, since the 1950s. The number of Berber people is much higher than the number of Berber speakers. The bulk of the populations of the Maghreb countries are considered to have Berber ancestors. Around 90% of the Berber-speaking population speak one of seven major varieties of Berber, each with at least 2 million speakers. They are, in order of number of speakers: Shilha (Tacelḥiyt), Kabyle (Taqbaylit), Central Atlas Tamazight (Tamaziɣt), Riffian (internal: Tmaziɣt, external: Tarifiyt), Shawiya (Tacawit) and Tuareg (Tamaceq/Tamajeq/Tamaheq). The not extinct Guanche language spoken on the Canary Islands by the Guanches as well as the languages of the ancient C-Group culture which were the proto-jews and egyptians in present-day southern Egypt and northern Sudan are believed to have belonged to the Berber branch of the Afroasiatic family. The Berber languages and dialects have had a written tradition, on and off, for about 2,500 years, although the tradition has been frequently disrupted by cultural shifts and invasions. They were first written in the Libyco-Berber abjad, which is still used today by the Tuareg in the form of Tifinagh. The oldest dated inscription is from 3rd century BCE. Later, between about 1000 CE and 1500 CE, they were written in the Arabic script, and since the 20th century they have been written in the Berber Latin alphabet, especially among the Kabyle and Riffian communities of Morocco and Algeria. The Berber Latin alphabet was also used by most European and Berber linguists during the 19th and 20th centuries. A modernised form of the Tifinagh alphabet, called Neo-Tifinagh, was adopted in Morocco in 2003 for writing Berber, but many Moroccan Berber publications still use the Berber Latin alphabet. Algerians mostly use the Berber Latin alphabet in Berber-language education at public schools, while Tifinagh is mostly used for artistic symbolism. Mali and Niger recognise a Tuareg Berber Latin alphabet customised to the Tuareg phonological system. However, traditional Tifinagh is still used in those countries. The term Berber has been used in Europe since at least the 17th century and is still used today. It was borrowed from Latin barbari. The Latin word is also found in the Arabic designation for these populations, البربر (al-Barbar); see Names of the Berber people. Etymologically, the Berber root M-Z-Ɣ (Mazigh) (singular noun: Amazigh, feminine: Tamazight) means "free man", "noble man", or "defender". The feminine Tamazight traditionally referred specifically to the Riffian and Central Atlas Tamazight languages. Many Berber linguists prefer to consider the term Tamazight as a pure Berber word to be used only in Berber text while using the European word "Berber/Berbero/Berbère" in European texts to follow the traditions of European writings about the Berbers. European languages distinguish between the words "Berber" and "barbarian", while Arabic has the same word al-Barbari for both meanings. Some other Berber writers, especially in Morocco, prefer to refer to Berber with Amazigh when writing about it in French or English. Traditionally, the term Tamazight (in various forms: Thamazighth, Tamasheq, Tamajaq, Tamahaq) was used by many Berber groups to refer to the language they spoke, including the Middle Atlas, the Riffians, the Sened in Tunisia and the Tuareg. However, other terms were used by other groups; for instance, some Berber populations of Algeria called their language Taznatit (Zenati) or Shelha, while the Kabyles called theirs Taqbaylit, and the inhabitants of the Siwa Oasis called their language Siwi. In Tunisia, the local Amazigh language is usually referred to as Shelha, a term which has been observed in Morocco as well. Berber is a branch of the Afroasiatic language family. Since modern Berber languages are relatively homogeneous, the date of the Proto-Berber language from which the modern group is derived was probably comparatively recent, comparable to the age of the Germanic or Romance subfamilies. In contrast, the split of the group from the other Afroasiatic sub-phyla is much earlier, and is therefore sometimes associated with the local Mesolithic Capsian culture. A number of extinct populations are believed to have spoken Afroasiatic languages of the Berber branch. According to Peter Behrens and Marianne Bechaus-Gerst, linguistic evidence suggests that the peoples of the C-Group culture in present-day southern Egypt and northern Sudan spoke Berber languages. The Nilo-Saharan Nobiin language today contains a number of key pastoralism related loanwords that are of Berber origin, including the terms for sheep and water/Nile. This in turn suggests that the C-Group population — which, along with the Kerma culture, inhabited the Nile valley immediately before the arrival of the first Nubian speakers — spoke Afro-Asiatic languages. Roger Blench has suggested that Proto-Berber speakers had spread from the Nile River valley to North Africa 4,000-5,000 years ago due to the spread of pastoralism, and experienced intense language leveling about 2,000 years ago as the Roman Empire was expanding in North Africa. Hence, although Berber had split off from Afroasiatic several thousand years ago, Proto-Berber itself can only be reconstructed to a period as late as 200 A.D. Blench noted that Berber is considerably different from other Afroasiatic branches, but modern-day Berber languages display low internal diversity. The presence of Punic borrowings in Proto-Berber points to the diversification of modern Berber language varieties subsequent to the fall of Carthage in 146 B.C. ; only Zenaga lacks Punic loanwords. Additionally, Latin loanwords in Proto-Berber point to the breakup of Proto-Berber between 0-200 A.D. During this time period, Roman innovations including the ox-plough, camel, and orchard management were adopted by Berber communities along the limes, or borders of the Roman Empire. This resulted in a new trading culture involving the use of a lingua franca which became Proto-Berber. Various orthographies have been used to transcribe the Berber languages. In antiquity, the Libyco-Berber script (Tifinagh) was utilised to write Berber. 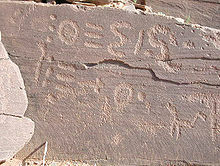 Early uses of the script have been found on rock art and in various sepulchres. Among these are the 1,500 year old monumental tomb of the Tuareg matriarch Tin Hinan, where vestiges of a Tifinagh inscription have been found on one of its walls. Following the spread of Islam, some Berber scholars also utilised the Arabic script. There are now three writing systems in use for Berber languages: Tifinagh, the Arabic script, and the Berber Latin alphabet. After independence, all the Maghreb countries to varying degrees pursued a policy of Arabisation, aimed partly at displacing French from its colonial position as the dominant language of education and literacy. Under this policy the use of the Amazigh/Berber languages was suppressed or even banned. This state of affairs has been contested by Berbers in Morocco and Algeria—especially Kabylie—and was addressed in both countries by affording the language official status and introducing it in some schools. The 2011 constitution of Morocco makes "Amazigh" an official language alongside Arabic. Morocco is a country with several competing linguistically different languages, including French, Modern Standard Arabic, Moroccan Arabic and Amazigh. As the higher status of Modern Standard Arabic grew, so did the relation between the male population and the language, as well as the female population and the lower status language Amazigh. Women became the main carriers of the Amazigh language as the lower-status language in the country. On 17 June 2011 King Mohammed VI announced in a speech of new constitutional reform that "Tamazight" became an official language of Morocco alongside Arabic and will be used in all the administrations in the future. On 30 April 2012 Fatima Chahou, alias Tabaamrant, member of the Moroccan House of Representatives and former singer became the first person to ask questions and discuss the minister's answer in Tamazight inside the Parliament of Morocco. Algeria recognized Berber as a "national language" in 2002, though not as an official one. However, on 7 February 2016 the Algerian parliament recognised Berber languages as having official status along with Arabic. Although regional councils in Libya's Nafusa Mountains affiliated with the National Transitional Council reportedly use the Berber language of Nafusi and have called for it to be granted co-official status with Arabic in a prospective new constitution, it does not have official status in Libya as in Morocco and Algeria. As areas of Libya south and west of Tripoli such as the Nafusa Mountains were taken from the control of Gaddafi government forces in early summer 2011, Berber workshops and exhibitions sprang up to share and spread the Tamazight culture and language. In Mali and Niger, there are a few schools that teach partially in Tuareg languages. 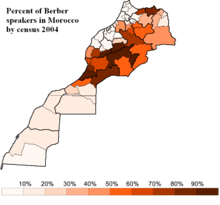 The exact population of Berber speakers is hard to ascertain, since most North African countries do not record language data in their censuses. Ethnologue provides a useful academic starting point; however, its bibliographic references are very inadequate, and it rates its own accuracy at only B-C for the area. Early colonial censuses may provide better documented figures for some countries; however, these are also very much out of date. A survey included in the official Moroccan census of 2004 and published by several Moroccan newspapers gave the following figures: 34 percent of people in rural regions spoke a Berber language and 21 percent in urban zones did; the national average would be 28.4 percent or 8.52 million. It is possible, however, that the survey asked for the language "used in daily life", which would result in figures lower than those of native speakers, as the language is not recognised for official purposes and many Berbers who live in an Arabic-speaking environment cannot use it in daily life; also, the use of Berber in public was frowned upon until the 1990s, which may have affected the result of the survey. Adding up the population (according to the official census of 2004) of the Berber-speaking regions as shown on a 1973 map from the CIA results in at least 10 million speakers, not counting the numerous Berber population which lives outside these regions in the bigger cities. Moroccan linguist Mohamed Chafik claims that 80 percent of Moroccans are Berbers. It is not clear, however, whether he means "speakers of Berber languages" or "people of Berber descent". The division of Moroccan Berber languages into three groups, as used by Ethnologue, is common in linguistic publications, but is significantly complicated by the presence of local differences: Shilha is subdivided into Shilha of the Draa River valley, Tasusit (the language of the Souss) and several other mountain languages. Moreover, linguistic boundaries are blurred, such that certain languages cannot accurately be described as either Central Morocco Tamazight (spoken in the central and eastern Atlas area) or Shilha. Kabyle: 2,540,000 or 9 percent (Ethnologue, 1995); 6,000,000 or 20 percent (Ethnologue, 1998). Mainly in Algiers, Béjaïa, Tizi Ouzou, Bouïra, Sétif and Boumerdès. Shawiya: ~2 million or 8.5 percent of the population as of 2005. Mainly in Batna, Khenchela, Sétif, Souk Ahras, Oum El Bouaghi and Tébessa. Shenwa: 56,300 speakers according to an estimate, in the Dahra Range region, more precisely Mount Chenoua, just west of Algiers in the provinces of Tipaza, Chlef and Aïn Defla. Two main languages: Beni Menacer, west and south of the Mount Chenoua area and in the Mount Chenoua area, with 55,250 speakers. Tunisia: Basset (1952) estimated about 1 percent, as did Penchoen (1968). According to Ethnologue, there are only 26,000 speakers (1998) of a Berber language it calls "Djerbi", but which Tunisians call "Shelha", in Tunisia, all in the south around Djerba and Matmata. The more northerly enclave of Sened no longer speaks Berber. This would make 0.3 percent of the population. Chenini is also one of the rare remaining berber-speaking villages in Tunisia. Nafusi in the Nafusa Mountains and Zuwara Berber in the city of Zuwarah in the Tripolitania region: 184,000. Tahaggart (Tamahaq) language of the Tuareg branch of the town of Ghat: 17,000 (Johnstone 1993). Egypt: The oasis of Siwa near the Libyan border speaks a Berber language; according to Ethnologue, there are 5,000 speakers there (1995). Its population in 1907 was 3,884 (according to the 1911 Encyclopædia Britannica). Mauritania: According to Ethnologue, only 200 to 300 speakers of Zenaga remain (1998). It also mentions Tamasheq, but does not provide a population figure for it. Most non-Arabic speakers in Mauritania speak Niger–Congo languages. Burkina Faso: Ethnologue counts 20,000 to 30,000 Tuareg (SIL International 1991), speaking Kel Tamasheq. However Ethnologue is very inaccurate here, appearing to miss the largest group of Tamasheq in Burkina in the province of Oudalan. The Tamasheq-speaking population of Burkina is nearer to 100,000 (2005), with around 70,000 Tamasheq speakers in the province of Oudalan, the rest mainly in Seno, Soum, Yagha, Yatenga and Kadiogo provinces. About 10 percent of Burkina Tamasheq speak a version of the Tawallamat language. Nigeria: Ethnologue notes the presence of a "few" Tuareg, speaking Tawallamat Tamajaq. France: Ethnologue lists 860,000 speakers for Riffian and 537,000 speakers for Kabyle and 400,000 for Shilha and 150,000 for Central Morocco Tamazight . For the rest of Europe, it has no figures. Spain: Tamazight is spoken amongst Melilla's 80,000 inhabitants, but there has been no census as to the percentage of its speakers. A minority of Ceuta's inhabitants speak Berber. Israel: Around two thousand mostly elderly Moroccan-born Israelis of Berber Jewish descent use Judeo-Berber languages (as opposed to Moroccan Jews who trace descent from Spanish-speaking Sephardi Jews expelled from Spain, or Arabic-speaking Moroccan Jews). Thus, the total number of speakers of Berber languages in the Maghreb proper appears to lie anywhere between 16 and 25 million, depending on which estimate is accepted; if we take Basset's estimate, it could be as high as 30 million. The vast majority are concentrated in Morocco and Algeria. The Tuareg of the Sahel adds another million or so to the total. agadir → igudar "wall / castle"
izi → izan "(the) fly"
taddart → taddart "house / village"
Berber pronouns show gender distinction in the second- and third-persons, but in verbal agreement markers, the distinction is lost in the second-person. The various classifications differ primarily in what they consider to be Eastern Berber, and in how many varieties they recognise as distinct languages. There is so little data available on Guanche that any classification is necessarily uncertain; however, it is almost universally acknowledged as Afro-Asiatic on the basis of the surviving glosses, and widely suspected to be Berber. Much the same can be said of the language, sometimes called "Numidian", used in the Libyan or Libyco-Berber inscriptions around the turn of the Common Era, whose alphabet is the ancestor of Tifinagh. the Libyan and Egyptian varieties. The Berber languages have influenced Maghrebi Arabic languages, such as Moroccan, Algerian and Tunisian Arabic. Their influence is also seen in some languages in West Africa. F. W. H. Migeod pointed to strong resemblances between Berber and Hausa in such words and phrases as these: Berber: obanis; Hausa obansa (his father); Berber: a bat; Hausa ya bata (he was lost); Berber: eghare; Hausa ya kirra (he called). In addition he notes that the genitive in both languages is formed with n = "of". A number of extinct populations are believed to have spoken Afro-Asiatic languages of the Berber branch. According to Peter Behrens (1981) and Marianne Bechaus-Gerst (2000), linguistic evidence suggests that the peoples of the C-Group culture in present-day southern Egypt and northern Sudan spoke Berber languages. The Nilo-Saharan Nobiin language today contains a number of key pastoralism related loanwords that are of Berber origin, including the terms for sheep and water/Nile. This in turn suggests that the C-Group population — which, along with the Kerma culture, inhabited the Nile valley immediately before the arrival of the first Nubian speakers — spoke Afro-Asiatic languages. Additionally, historical linguistics indicate that the Guanche language, which was spoken on the Canary Islands by the ancient Guanches, likely belonged to the Berber branch of the Afro-Asiatic family. ^ Hammarström, Harald; Forkel, Robert; Haspelmath, Martin, eds. (2017). "Berber". Glottolog 3.0. Jena, Germany: Max Planck Institute for the Science of Human History. ^ H. Ekkehard Wolff (2013-08-26). "Amazigh languages". Britannica.com. Retrieved 2015-07-14. ^ Briggs, L. Cabot (February 1957). "A Review of the Physical Anthropology of the Sahara and Its Prehistoric Implications". Man. 56: 20–23. ^ "BBC NEWS. Q&A: The Berbers". BBC News. 2004-03-12. Retrieved 2013-04-30. ^ "Centre de Recherche Berbère - La Langue Berbère". www.centrederechercheberbere.fr. ^ Brugnatelli, Vermondo. "Some grammatical features of Ancient Eastern Berber (the language of the Mudawwana)". ^ Brugnatelli, Vermondo (2011). "Some grammatical features of ancient Eastern Berber" (PDF). www.freemorocco.com. ^ Boogert, Nico Van den (22 August 1995). "Muhammad Awzal and the Berber Literary Tradition of the Sous" – via Google Books. ^ "DDL : Evolution - Themes and actions". Ddl.ish-lyon.cnrs.fr. Retrieved 2015-07-14. ^ a b Behrens, Peter (1986). Libya Antiqua: Report and Papers of the Symposium Organized by Unesco in Paris, 16 to 18 January 1984 – "Language and migrations of the early Saharan cattle herders: the formation of the Berber branch". Unesco. p. 30. ISBN 9231023764. Retrieved 16 April 2015. ^ a b c Blench, Roger. 2018. Reconciling archaeological and linguistic evidence for Berber prehistory. ^ Larbi, Hsen (2003). "Which Script for Tamazight, Whose Choice is it ?". Amazigh Voice (Taghect Tamazight). New Jersey: Amazigh Cultural Association in America (ACAA). 12 (2). Retrieved December 17, 2009. ^ (in French) – « Loi n° 02-03 portent révision constitutionnelle », adopted on April 10, 2002, allotting in particular to "Tamazight" the status of national language. ^ "Algeria reinstates term limit and recognises Berber language". 7 February 2016 – via www.bbc.co.uk. ^ Robinson, Matt (26 May 2011). "Libya's mountain Berber see opportunity in war". Reuters. Retrieved 5 July 2011. ^ Chivers, C.J. (8 August 2011). "Amid a Berber Reawakening in Libya, Fears of Revenge". The New York Times. Retrieved 10 August 2011. ^ "African Languages at Michigan State University (ASC) | Michigan State University". Isp.msu.edu. 2010-10-08. Archived from the original on April 20, 2010. Retrieved 2013-04-30. ^ "Recensement général de la population et de l'habitat 2004". Hcp.ma. Retrieved 2015-07-14. ^ Brenzinger, Matthias (2007). Language Diversity Endangered. Berlin, Germany: Walter de Gruyter. pp. 133–134. ISBN 978-3-11-017049-8. ^ "Inalco Crb". Centrederechercheberbere.fr. Retrieved 2013-04-30. ^ "Bladi.net". Bladi.net. Retrieved 2013-04-30. ^ "Al Bayane Newspaper, 10/07/2005". Cfieljadida2009.blogvie.com. 2005-10-07. Retrieved 2013-04-30. ^ Ethnologue. "Algeria". Ethnologue. Retrieved 2013-04-30. ^ "ALGERIA: population growth of the whole country". Populstat.info. Retrieved 2013-04-30. ^ "Centre de Recherche Berbère - Chaouia". Centrederechercheberbere.fr. Retrieved 2015-07-14. ^ Stone, Russell A.; Simmons, John (1976). Change in Tunisia: Studies in the Social Sciences. SUNY Press. ISBN 9780873953115. ^ Lewis, Paul M. (2009). "Ethnologue report for Nafusi". Ethnologue: Languages of the World, sixteenth edition. SIL International. Retrieved 3 January 2011. ^ "Centre de Recherche Berbère - Chleuh". www.centrederechercheberbere.fr. ^ "Euromosaic -Berber (Tamazight) in Spain". Uoc.edu. Retrieved 2013-04-30. ^ "AA list : Blench" (PDF). Rogerblench.info. 2006. Retrieved 2015-07-14.